Camilla Valley Farm stocks all the tools required for Tapestry weaving. This includes Combs, Bobbins, Rya and Pick-up sticks. Used by Tapestry artists to beat the weft in, Leclerc makes two Tapestry Beaters or Combs. The Light Comb in the foreground has 8 Teflon coated teeth and weighs 1/4 pound (115 gram). 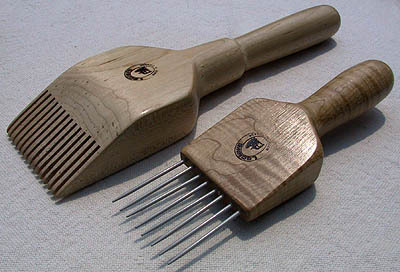 The comb is made out of Maple hardwood and is 8 inches (20 cm) long and 2 1/4 inches (55 mm) wide. The teeth are 1 3/4 inches (45 mm) long. The Heavy Comb is also made of hard Maple and is great for beating weft for carpets of knotted pile or any material where a very stiff fabric is the desired result. The Comb has been designed with internal metal weights to make it weigh 2 pounds (900 grams) and is 2 13/16 inches (72 mm) wide and 11 inches (28 cm) long with 15 teeth, each 1 3/8 inches (35 mm) long. Used by Tapestry Artists to make insertion of warp threads easier and for various pick-up techniques, Leclerc makes 4 different Pick-up sticks, all out of Maple hardwood. Leclerc makes Tapestry Bobbins in 2 sizes. Small Tapestry Bobbins are made of high impact styrene (plastic) and are 5 inches (127 mm) long and 7/16 inches (11 mm) in diameter. They come in packs of 12 and are shown in the picture to the left. 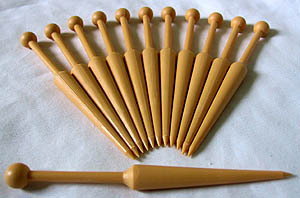 Large Tapestry Bobbins (not shown) are made of Maple hardwood and are 7 inches (18.0 cm) long and 1 1/8 inches (25 mm) in diameter at its widest part. The Large Bobbins are sold individually.